My fourth and final week of Pileated and White-headed Woodpecker surveys in the Boise National Forest has come to a close. The project is over for this year, but no time to waste. It is just four days until I launch my next project surveying for eight woodpecker species within the Caribou-Targhee National Forest. The previous reports on my Boise National Forest project can be found here: Into the Woods-The New Field Season Begins, Woah, Seven Woodpecker Species on One Transect, and Holes in a Tree. My final bout of surveys included two routes near Idaho City and one route just east of Horseshoe Bend, Idaho. Most of our survey routes are on old forest roads, although some are on trails. The surveys consist of ten minutes at each of ten points, separated by 350m (1/4 mile). I start the first point 30 minutes before local sunrise, usually finishing the last about 9am. In this case sunrise is calculated when the sun reaches an angle relative to the horizon assuming that the terrain is flat. In many cases, because of local terrain, I may not actually see the sun until points six, seven, or even point nine. The first day was the most exciting for numerous reasons. Between points four and five, before the sun was visible, I was walking around a bend in the road. I was generally glancing upwards to look for bird activity when movement caught my eye up the road. About 50 meters (~50 yards) up the road a mountain lion jumped down into the roadway. It paused momentarily broadside and looked at me. Wow! I still get goose bumps thinking about it. I reached for my camera as it ran about 50m up the road and over the edge and out of sight. Wow! Really Wow! It was reasonable dark colored, darker than most photos, but may have been enhanced by the low light. What I remember most is how long it was. Long torso and long tail extending across the road. Wow! I am still in awe of the moment. While doing field work I often find recent mountain lion tracks. Probably about a 6-10 times a year. But I have only see a wild mountain lion on one other occasion. I know that they have seen me much more often. Helping to enhance the first day of surveys in this bout, was the fact that I detected both Pileated and White-headed Woodpeckers, our two target species for this project. I finished the day ecstatic, on a fieldwork high! Definitely the highest of the season! The last two days of surveys were not as fulfilling – no mountain lions, no Pileated Woodpeckers, and no White-headed Woodpeckers. Proof that I do work in the field! Deadman Ridge, Boise National Forest. Karyn joined me for the final few days of work. It was great to spend time with her in the field. 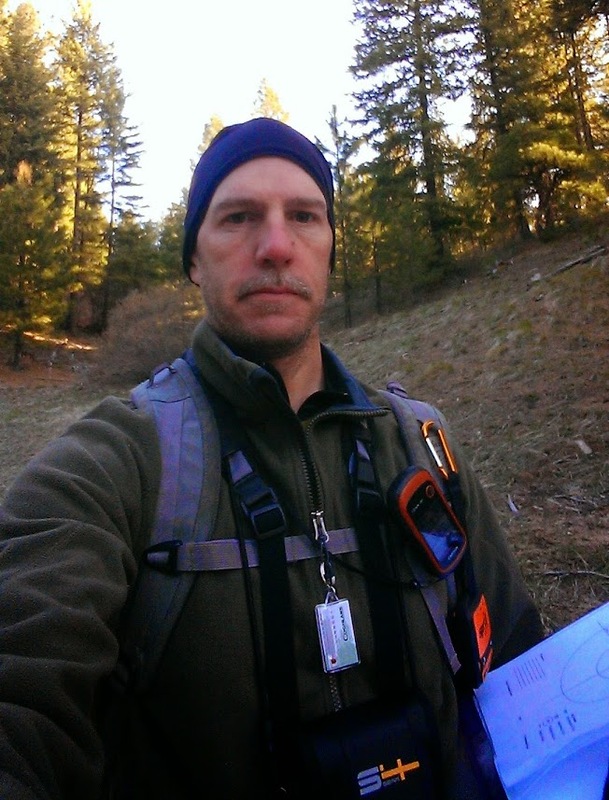 If you are reading this you probably know that I am a goshawk specialist, leading the Intermountain Bird Observatory’s goshawk research for the past five years. During our woodpecker surveys, if I am in the area of goshawks nests, I often spend some of my afternoon time checking the status to report back to the forest service. In addition to monitoring woodpeckers, most national forests in Idaho including the Boise, also monitor goshawk productivity within their forest. I am not responsible for the Boise National Forest goshawk surveys, but I try to contribute when convenient. Karyn and I hiked in to check the status of three goshawk nests one afternoon. One had fallen completely out of the tree, one was in a state of disrepair, but one had been built up and appeared to be ready to go. This means that a goshawk is committed to the territory, but not necessarily a pair. If a pair is present, egg laying should begin any day now. We did not broadcast any calls as goshawks can be very sensitive this time of year. We spent a minimum amount of time looking around and then retreated quickly to leave the birds in peace. The forest service will check the nest a again in three or four weeks. It got me excited for my upcoming goshawk season which kicks off in early June. Improved goshawk nest, Boise National Forest. During my surveys, Karyn played photographer to capture some of the awesomeness of the outdoors. At one point we were swarmed by a flock of Mountain Chickadees. Can you find one in the photo? Mountain Chickadee, Deadman Ridge, Boise National Forest. Is it a tree, is it a snag? For me the first project is over (Jessica still has two routes next week). Next up for me, surveying for eight woodpecker species (Downy, Hairy, American Three-toed, Black-backed, and Lewis’s Woodpeckers, Northern Flicker, and Red-naped and Williamson’s Sapsuckers) within the Caribou-Targhee National Forest. I will be there to train my two-person crew for a week and then pick up a few routes solo, before heading back home. Stay tuned for updates! My third week of woodpecker surveys in the Boise National Forest has come to a close. I can’t believe that my first full project of the season is almost over. Just three more survey days left to go before I put this first project in the books and start the next. This is my third blog post on this project. The previous reports can be found here: Into the Woods-The New Field Season Begins and Woah, Seven Woodpecker Species on One Transect. As I have stated in my previous posts, I am surveying for Pileated and White-headed Woodpeckers within two ranger districts (Emmett and Idaho City) of the Boise National Forest. Unfortunately, this week was short on White-headed Woodpeckers for me. I didn’t detect any. However, the Pileated Woodpeckers were present on three of my four survey routes. This past week I was surveying north of Ola, Idaho. It is a fairly remote area with few people. In my first three days of surveys I saw one vehicle and that was as I was transferring from one site to another. The rest of the time, it was just me in the wilds! The only indication of the greater world was the noise disruption coming from passing airplanes. The following photo illustrates the importance of forest management practices on wildlife. This single tree had more than 20 nesting cavities in it housing untold number of species. I see five cavities visible in the photo. Each cavity can provide a nesting location for up to 20-30 years. Hence, a single snag could be an important resource for hundreds, possibly over a thousand of birds. Oh yeah, and there is a Pileated Woodpecker foraging on it as well. Dead trees attract insects which can help feed all those birds. I have performed woodpecker surveys for years and I am still awestruck contemplating the complexity of the ecosystem of a single tree. Pileated Woodpecker on a snag with many nesting cavities, Boise National Forest. Pileated Woodpecker on a snag, Boise National Forest. Third Fork Ridge provides one of the most spectacular camping locations of the project. It didn’t hurt that it was a beautiful clear day with no wind. I was awoken in the night with elk chewing grass just outside my field truck. View from my camp, Third Fork Ridge, Boise National Forest. My work begins each day a half hour before sunrise. Sometimes I need to start earlier to hike to the first point by this time. I love the sunrise. I am usually at my third or fourth survey point of the day as the sun comes up over the ridge. This is when the bird activity is usually at its peak. It is referred to as the “dawn chorus”. In previous weeks, my efforts to detect woodpeckers were hampered by so many Red-breasted Nuthatches singing their loud “yank-yank” song, it was hard to hear most anything else. This week, the nuthatches were still present, but the dynasty of Ruby-crowned Kinglets took the show as the most abundant and loudest species out there singing it’s “liberty-liberty-liberty” song. It’s amazing as they are the second smallest bird in North America (excluding hummingbirds), but one of the loudest. Sunrise at third point of the day, Second Fork Squaw Creek, Boise National Forest. I finally found some some-what fresh wolf tracks. In three years of performing these woodpecker surveys, this year I have found the least number of fresh tracks. I don’t know if this translates to fewer wolves actually in the area. While many people in Idaho may approve of fewer wolves, I for one do not. I appreciate the fact that wolves have a very important ecological role to play in our ecosystem. I love finding tracks, just to know that they are there doing their job. Wolf tracks, Boise National Forest. The rest of the wildlife was great as well. More deer, elk, snow-shoe hare and of course the birds. I had Northern Saw-whet Owls in two of my camps. The last night, one was perched just above my camp, calling most of the night. It was calling as I went to sleep, as I awoke in the night, and when I got up in the morning. Add to the list my first Common Poorwill of the year, many grouse (Dusky and Ruffed), and tons of bluebirds. It was all great. Mountain Bluebird, Boise National forest. My 2015 field season kicked off in a spectacular way. 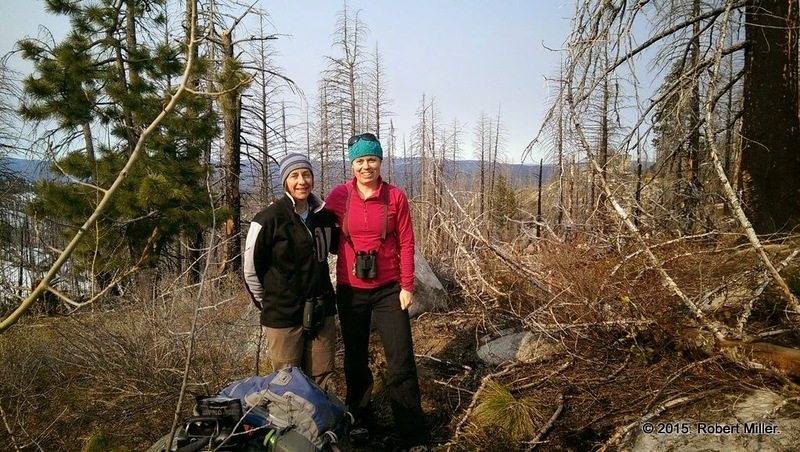 The first project involves surveying for Pileated and White-headed Woodpeckers in the Boise National Forest. Both species are “Management Indicator Species” for the Boise National Forest. The Pileated is much more common of the two. The White-headed Woodpecker is rare and is currently listed by the Idaho Fish and Game as a “Species of Greatest Conservation Need” with a rank of “Imperiled”. The White-headed Woodpecker is also listed as a “Sensitive” species by the USDA Forest Service. I have 14 survey routes to complete over the next few weeks, which should keep me plenty busy. I am able to survey one route a day starting 30 minutes before local sunrise and finishing the route about 10am. I then have to hike back out and move camp to the next survey route. During last year’s surveys, we failed to detect White-headed Woodpeckers on any of the 25 survey routes, but had quite a few Pileated Woodpeckers present. The White-headed Woodpecker is rare in the forest, but we should find at least a few on survey. We hoped our luck would change that this year. 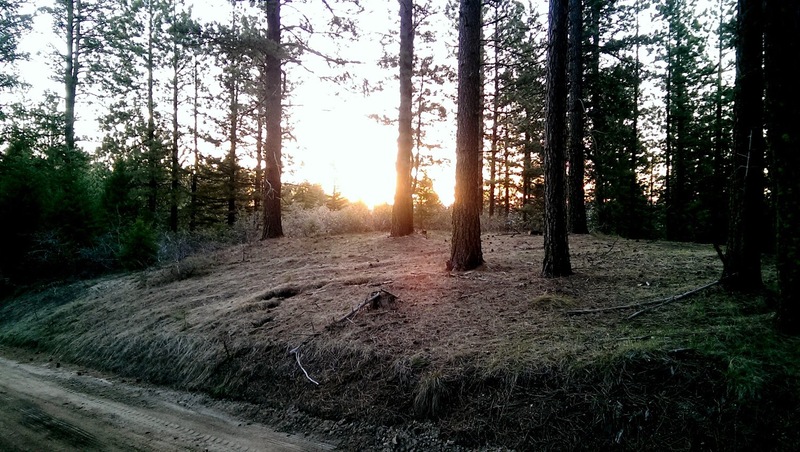 I departed home in the late afternoon, heading to set up camp at my first survey route east of Idaho City, Idaho. My camp was right at the first point of the survey on a beautiful ridge. Red-tailed Hawks and Common Ravens soared overhead. It was great to be back in the woods. It was cool and breezy, but the clouds from the previous few days were beginning to clear. That evening, I was arranging my gear when I heard what I was sure was a White-headed Woodpecker. I jumped up and grabbed my binoculars. I scanned the area where the call had come from and found two Hairy Woodpeckers. Their rattle calls are very similar, but I was sure I had heard a White-headed. I couldn’t believe I was wrong. I searched some more and all I found were the two Hairy Woodpeckers. My confidence was shaken… I went back to work on my gear, when, there it was, I heard it again! It had to be a White-headed Woodpecker. I resumed my search and bingo, not only were there two Hairy Woodpeckers, but two White-headed Woodpeckers. Fantastic! I spent the evening watching and listening to both pairs. They alternated between forging independently, mixed with bouts of inter-species aggression. In this interaction the female Hairy Woodpecker seemed to be a bit more aggressive and winning the stare-down with the male White-headed. She eventually pushed the White-headed down the branch until it left. She did not pursue. Male White-headed Woodpecker staring up at female Hairy Woodpecker, Boise National Forest. Male White-headed Woodpecker, Boise National Forest. Female White-headed Woodpecker, Boise National Forest. On survey the next morning, I detected the male White-headed at the first point. The drought was over! At one of my later survey points I found a pair of Pileated Woodpeckers each foraging on a dead log, but I only got photos of the male. Male Pileated Woodpecker, Boise National Forest. When I arrived back at my camp after the survey, there was also a Pileated in my camp! What a great first day of surveys – White-headed Woodpecker, Pileated Woodpecker, Hairy Woodpecker, and Red-naped Sapsucker among many other cool birds. The other big find was a Barred Owl hooting just before sunrise. This is a very rare breeding bird in this area. Lets see what the second day has in store! Day 2: My surveys on the second day were along the Warm Springs Ridge, west of Idaho City. Unfortunately, my luck from day one didn’t carry over to day two. I found Hairy Woodpeckers and Red-naped Sapsuckers on survey. After the survey was over and I was hiking back to camp, I did observe Pileated Woodpeckers. I plan for a couple of days off and then launch on six days in a row next week. Sunrise on Warm Springs Ridge, Boise National Forest. And then … the worlds worst selfie! Maybe I should focus more on smiling than on taking the photo. Ha.Ha. Raptor Rob’s poor attempt at a selfie!